You can enjoy all the fun of the Whitsundays with our half day activities. Half day tours are great if you are limited on time, or if you're just trying to fill in a morning or afternoon with a little extra fun. Half day tours include scenic flights, aerial adventures, on-land exploration and short island excursions! Choose from a variety of tours that are short on time, but never short on fun. See the islands in a whole new way with Island Jet! Zoom around at 40km an hour! Departs twice daily from Airlie Beach! Check out the area in the most extreme way possible - while free falling at 220kms per hour! 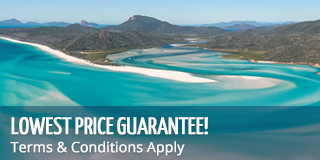 Cruise over Whitehaven Beach, Hill Inlet and the Great Barrier Reef! Join our Outer Reef and Beach Scenic Flight and see the Whitsundays from above! Touch-and-go water landing at the Great Barrier Reef for unique experience! Visit one of the world's best beaches! A MUST DO in the Whitsundays! Unique tour that allows you to cruise in comfort! Everyone gets their own segway! One of the most innovative tours in the Whitsundays! Jump onboard and hold on for the ride of your life. 30 minutes of wild fun! The ultimate in relaxation, jump on board the 'Sundowner' and set off into the beautiful Whitsunday sunset! Great for any type of celebration! The ultimate bush experience with plenty of bite! See Australian wildlife up close! Find out why Whitsunday Jetski Tours is so popular on one of their guided jetski tours around the Whitsunday Islands. Choose from four different, amazing tours! There is a tour for everyone to experience jetskiiing in the Whitsundays! Spend the morning exploring the Great Barrier Reef for an amazing half day adventure! The only way to see the Great Barrier Reef in a half day! Latest craze and worth all the fun!